A clutch in a Toyota pickup will cost is between $600 – $900, depending on what parts need to be replaced, whether the car has a v6 engine or a 4 cylinder, and if it’s a 4×4 truck. A clutch in a Toyota Camry costs between $600 – $900, depending on what parts need to be replaced and whether the car has a v6 or a 4 cylinder engine. A clutch for a Mazda pickup costs between $550 – $800, and depends on what parts need to be replaced, whether the car has a v6 or 4 cylinder engine, and if it’s a 4 wheel drive. A Honda Civic clutch costs $499 – $800, depending on what parts need to be replaced and what type of 4 cylinder engine it has. An Si Honda Civic will cost more than a standard model Civic. The clutch for a Volkswagen Jetta is between $500 – $1500. Some of these cars use a special flywheel that requires replacement, so that adds considerable cost to the repair. BMW vehicles, such as a M3, can cost over $2000 dollars to replace the clutch. It depends on the year of the vehicle, too. A Mini Cooper’s clutch cost will vary widely, depending on the model. On average clutch repair will cost about $1200 – $2000 if you need to replace the flywheel. Clutches on Ford F-150 and Ranger pickups will range between $600 – $900, but these vehicles also have an internal slave cylinder. You should always spend the extra money, typically $150 – $200, to have this component replaced. It will save you in the long run, believe us. In order to replace this component, you must remove the transmission to gain access to it. Vehicles that are front wheel drive usually cost more than other vehicles because these vehicles require more labor to remove the transmission. In some cases, front wheel drives will require the engine to be removed in order to replace the clutch. Yes, that’s lot’s of work, but we’re happy to do it. Warranty — A good warranty on a clutch should be at least 3 years or 36000 miles. Parts — You should also make sure that all the parts are new and that you replace the clutch disk, pressure plate and release bearing. Some vehicles also use a pilot bearing and some also use a internal slave cylinder (or hydraulic release bearing). You should also make sure that your flywheel is resurfaced or replaced. Some replacement flywheels can be very costly but if you don’t replace them or resurface them. How do you know your flywheel needs repair? Your vehicle will vibrate badly in first gear and reverse when you are letting out the clutch. A bad flywheel will prematurely wear out the clutch and will cause other damage to the vehicle. 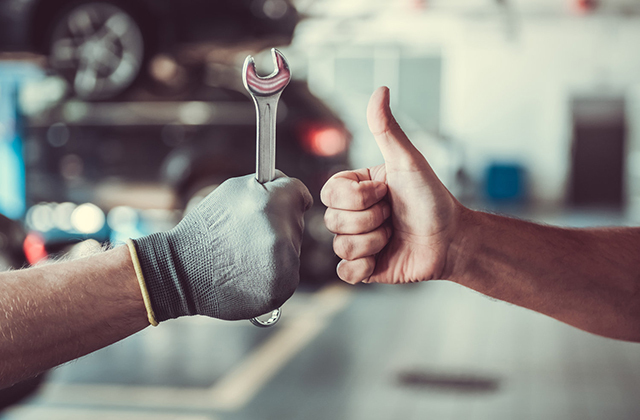 Transmission Service – Replacement of the transmission fluid and a few engine fluids are very inexpensive to do when the transmission is already removed. If you choose to have them replaced after the transmission is back in, it could be very pricey. Examples include the crankshaft rear main seal and the engine freeze plugs behind the transmission. The freeze plugs and the rear main seal should be inspected and possibly replaced when the transmission is removed. Click here for transmission fluid repair.